In early May, retail and law enforcement professionals came together for the second quarter New York City Loss Prevention Collaboration Meeting. Attendees included representatives from 15 different retailers, mall security directors, the NYPD, and the United States Secret Service. The keynote speakers included Sergeant Tarik Sheppard of the NYPD and two Special Agents from the United States Secret Service. Topics ranged from the planned development of a New York Organized Retail Crime Association- (NYORCA) to electronic crimes against retailers. The NYC LP Collaboration Meetings focus on building relationship between law enforcement and retailers in an effort to combat retail theft. A special thanks to Sephora for hosting the second quarter meeting. For information regarding upcoming events contact the NYC LP Meeting coordinators Chip Chiappetta at ChipChiappetta@DSWInc.com or Tarik Sheppard at TARIK.SHEPPARD@nypd.org. The North Texas Area Crime Trackers (ACT) group and list serve began in 1999, and currently has around 550 members. ACT is a network of Law Enforcement and Loss Prevention professionals working together on common crime issues. Because it is simple to use and extremely effective, it continues to grow. The list serve network is maintained by the Irving,Texas Police Department and was started originally by retired officer Tommy Hudspeth. Chief Larry Boyd of the Irving Department has continually supported this highly effective tool. Charlie Tyner, Div. LP Manager for Kroger, has been the driving force behind this group. Members must apply to get on the list serve (through the Irving Police Department) and credentials are checked at the door of any meetings held. Members may broadcast a message to all 550 plus participants by simply sending their message to the ACT email address. The rules are: only intel, and law enforcement related training opportunities, no solicitations or advertising or endorsing allowed. The group shares the intel with other similar networks when the information is relevant. 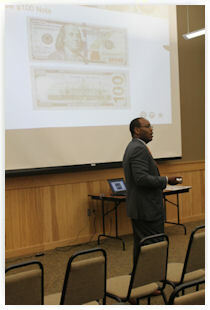 ACT has helped to solve a lot of local crimes in North Texas through their list serve and local meetings. 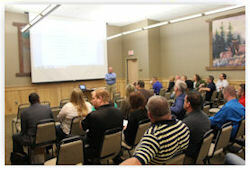 ACT holds meetings about twice a year with average attendance ranging from 50 to 100 members, depending on what is going on at the time. 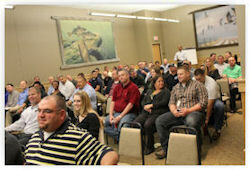 Here are some photos from a recent ACT Intel meeting held at Cabela's Sporting Goods in North Fort Worth. The meeting was led by Charlie Tyner (Kroger Div LPM), Grant Gulickson (Capital One Investigations) and Brett Lefever (Cabela's Asset Protection), and 100 Law Enforcement and retail representatives gathered from all over Texas. ACT is a free service that allows you to share criminal activity with other members. We all know that there are professional criminals and families that make their living stealing, so let’s share that information.